Integrators and developers of cellular network based M2M solutions need easy-to-use tools to test and develop their products. The IoT² 608 is invaluable in developing secure and reliable M2M products. Modern M2M solutions based on mobile networks (GSM, GPRS, EDGE, 3G, HSPA, LTE) often use cellular modems which are tested and pre-certified by the modem manufacturer for compliance with regulatory standards and/or protocol conformance. Still, manufacturers of M2M solutions need to perform a variety of tests regarding the electrical/RF integration, including antenna design. Reliability and Security of the application software need to be ensured for all scenarios encountered in various mobile networks the product may roam to. While the electronic and RF design of a given M2M solution is fairly static and related tests could thus be performed once by external laboratories, the application software side is typically developed much more dynamically, with frequent updates across the product lifecycle. Testing continuously against simulated cellular networks not only speeds up development, but also allows to test against a much wider range of scenarios, leading to more robust, secure and reliable M2M product solutions. wanted / unwanted SMS, Voice calls etc. The sysmocom IoT² 608 Internet of Things Tester provides a versatile solution to simulate the above network situations and many more in a complete automatable environment. Up to six network simulators are combined and controlled by a master controller. The master controller provides two separated mobile operator environments to simulate roaming and provider change. The signal level of each cell (network simulator) can be individually attenuated to arrange for a dynamically changing RF environment. 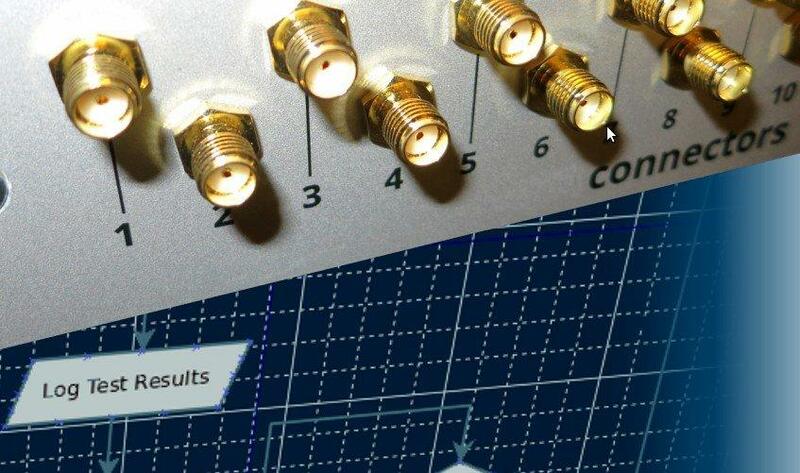 The devices under test (DUT) can be connected either directly via coaxial cable, or be placed inside a RF shielded compartment for testing over the air interface. In order to self-test the system at any time, the master controller is equipped with an internal cellular modem. Matching your M2M application's maturity, you may start with a minimal IoT² system configuration consisting of only three modules (master controller, one network simulator and network switch). This setup can be expanded at any time with additional network simulators, to cover further cellular standards or more complex test scenarios as needed. All components are in 1U 19" form-factor with shallow depth and could be ordered as a complete testing unit in a 9U Desktop Rack (other cases for higher mobility on request). Data: GPRS PCU with limited feature set. Initial EDGE implementation.